Anybody with a penchant for hors d’oeuvres is going to appreciate this nifty pan. From bite-sized quiche to tasty little cakes, creating petite snacks has never been easier. The Chicago Metallic Lift & Serve Single Squares Pan bakes a dozen appetizing treats at a time. It features twelve individual cups each measuring 1¾-inch square by ¾ of an inch deep. When done, the delicate dishes pop right out of the nonstick pan simply by pushing up from underneath. 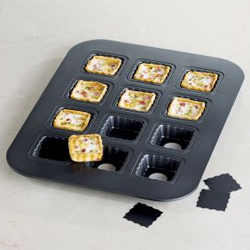 Unlike other stubborn pans, the removable inserts help to lift the food out, leaving you with easy to handle delicious appetizers that are just a bite away.